Metal Shark derives about 25% of its business from the ferry market, building ferries for multiple mar-kets across the country. 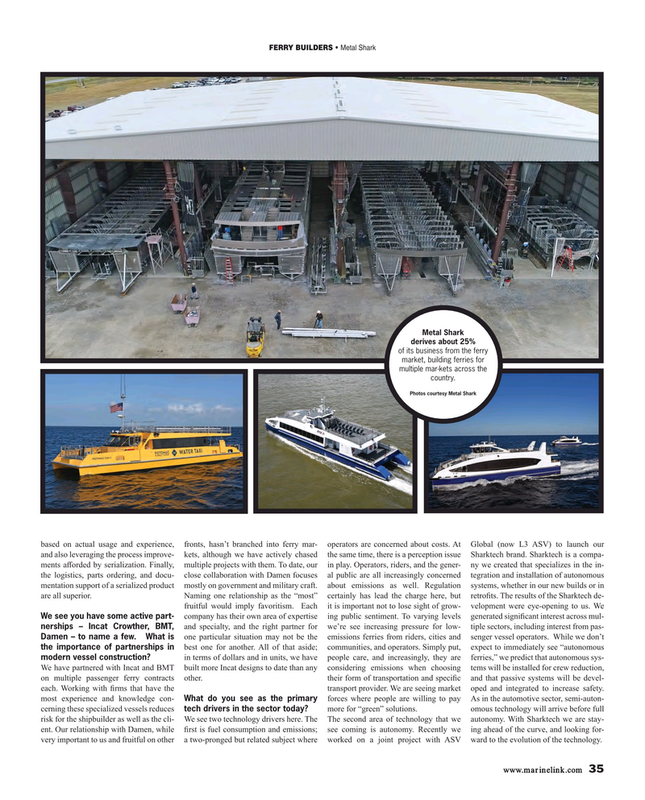 We have partnered with Incat and BMT built more Incat designs to date than any considering emissions when choosing tems will be installed for crew reduction, on multiple passenger ferry contracts other. their form of transportation and specifc and that passive systems will be devel- each. Working with frms that have the transport provider. We are seeing market oped and integrated to increase safety. most experience and knowledge con- What do you see as the primary forces where people are willing to pay As in the automotive sector, semi-auton- cerning these specialized vessels reduces tech drivers in the sector today? more for “green” solutions. omous technology will arrive before full risk for the shipbuilder as well as the cli- We see two technology drivers here. The The second area of technology that we autonomy. With Sharktech we are stay- ent. Our relationship with Damen, while frst is fuel consumption and emissions; see coming is autonomy. Recently we ing ahead of the curve, and looking for- very important to us and fruitful on other a two-pronged but related subject where worked on a joint project with ASV ward to the evolution of the technology.